DANBURY, Conn., March 20, 2013 – Rinco Ultrasonics, a leading manufacturer of ultrasonic welding equipment, has recently been awarded a U.S. patent for its PPS0145 film sealing technology for ultrasonic film sealing of flexible packaging. The patented PPS film sealing technology, with its interlocking tooling design, elevates ultrasonic welding to a new performance level, enabling users to increase seal strength, improve aesthetics, and broaden the processing window versus competitive ultrasonic sealing and heat sealing processes. The patent (US 8,376,016) was recently granted to Gordon Hull, U.S. managing director of Rinco Ultrasonics. “Our patented process shatters the preconceived notion that ultrasonic seals must be unattractive, narrow, and straight,” said William Aurand, Rinco sales mgr. “Further, the new technology significantly opens the processing window for the ultrasonic sealing process.” Rinco plans to strengthen its position in flexible packaging with this breakthrough film sealing technology by simplifying the use of ultrasonic sealing and creating more aesthetically pleasing seals. The company’s new FPA series ultrasonic pouch sealing systems incorporate the patented technology for flexible packaging of dry and liquid foods, personal care items, and electronics. They have been designed to replace existing heat sealing equipment on liquid filled pouch form-fill-seal (FFS) machinery or pre-made pouch systems.Due to the nature of traditional ultrasonic sealing processes, the surface area of the bond must be kept to a minimum to focus the frictional forces that are applied. This results in today’s very narrow and straight conventional ultrasonic seals throughout the packaging industry. Rinco’s unique PPS0145 interlocking film sealing technology permits seal patterns with greater surface area than competitive ultrasonic seals. The unique interlocking design creates a wide lattice of extremely focused lines of force within the seal area. This creates seals over a much greater overall surface area, while still focusing the initial contact point as required by the process. A key benefit of the new technology is the ability to enhance aesthetics. Seals from 2-mm to 25-mm are now possible compared to 1-mm to 2-mm previously, according to Aurand. With the interlocking design and robust equipment, Rinco can offer wider ultrasonic seals which are preferable by end users. The wider seal eliminates the need for follow-up heat sealing, thus saving time and cost. In addition, the technology allows production of contour-shaped seals, unlike the straight line seals offered by competitive ultrasonic equipment. These seals can take almost any configuration, offering end users a range of branding options to differentiate their products, according to Aurand. To further enhance the aesthetics of the bond, Rinco has recently developed the ability to emboss a design or logo into the seal area. Designs and logos are achieved by simply relieving an area of the seal pattern. The unsealed area stands out brilliantly, displaying the design. Not only does this concept greatly enhance the seal’s appearance but it actually provides a benefit to the sealing process. The relieved section of the tool face reduces the overall bond surface area, allowing for reduced clamp force and shorter cycles. An added benefit of the patented sealing process is a more predictable melt, beginning with the focal lattice of force previously described and ending with a completely sealed surface. As a result, Rinco’s processing window is significantly wider than competitive ultrasonic film sealing systems, thus overcoming one of the objections voiced by many companies when integrating ultrasonic equipment, says Aurand. Potential ultrasonics users want the benefits of increased seal strength, improved seal reliability, and the ability to seal through contaminants, but the narrow processing window of conventional ultrasonic sealing systems was very difficult to maintain in a production setting. The patented ultrasonic seal technology can also deliver an increase in bond strength over conventional ultrasonics. Depending upon the film used, Rinco has determined that its interlocking pattern can provide a 20% stronger bond than conventional ultrasonic seals. Moreover, the PPS technology provides users the capability to vary the seal strength by simply making seal parameter adjustments. Rinco manufactures the FPA series ultrasonic pouch sealing system at its Danbury facility. The company has already sold many systems to OEMs, co-packers, and end users in the U.S. and abroad. 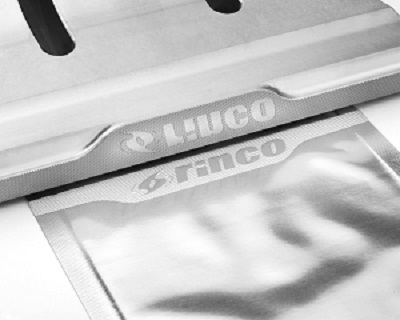 Rinco Ultrasonics is a specialist in the design and manufacturing of ultrasonic bonding and cutting machinery. Since 1997, the company, based in Romanshorn, Switzerland, has been an affiliate of the Crest Group, making them American owned. The company operates internationally, employing more than 100 persons worldwide. The company’s products are used to weld plastic components and to cut synthetic textiles as well as food products. The modular design of the systems enables them to be easily retooled and upgraded. With a wide range of frequencies and power outputs, Rinco can offer a suitable system for almost any application. With nine wholly owned subsidiaries, including the Danbury Conn. operation in the U.S., Rinco offers a global presence and wide-reaching technical support. For more information, visit www.rinco-usa.com.